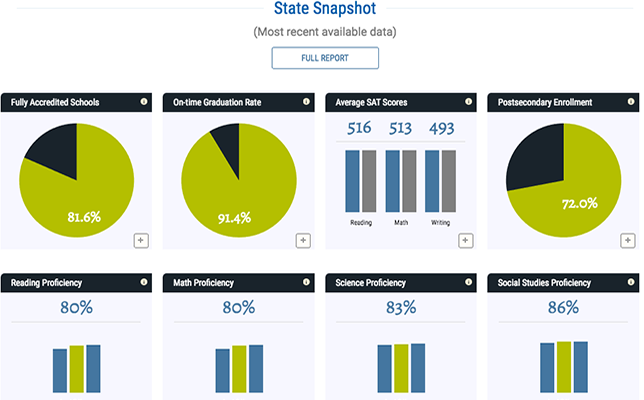 As states are busy submitting their response to the new regulations set by the Every Student Succeeds Act (ESSA), the Virginia Department of Education (VDOE) worked with AIS Network (AISN) to develop a website that captures report card data and puts it into context that is meaningful and useful for parents, students and the general public. State report cards are one component of the No Child Left Behind Act that carried over when President Obama signed ESSA in December 2015. But a recent report from the Data Quality Campaign — which reviewed report cards from all 50 states and the District of Columbia — found that only a handful of report cards are new, while others are inadequate. The nonprofit concluded that finding and interpreting state report cards can be confusing since information is scattered across many websites, some of which are outdated by a few years. VDOE’s new School Quality Profiles site serves as an online data tool that clearly communicates the status of achievements of Virginia’s public schools, including “reports on gifted education programs, average class sizes and statistically valid surveys of students, teachers and other school employees on the learning environment,” according to a news release. AISN, a high compliance and secure IT managed services expert serving the Commonwealth of Virginia and large enterprises, answered the 2015 General Assembly’s call to redesign online reports, according to the news release. The company created a site that can be assessed by mobile device. It is “Section 508 compliant, satisfies all the Virginia State IT Accessibility Requirements and Virginia.gov State Website Standards, and meets ADA Standards for Accessible Design,” the release said. To learn more about the site’s functionality, watch the video below. The School Quality Profiles site is now live.